Last weekend, we had the opportunity to celebrate our very first Hanukkah... in Korea. In my opinion, this is equally as weird as celebrating Ramadan in Switzerland or the Fourth of July in Egypt. Nevertheless, it was a great experience. As always, spending time with the wonderful friends we've made here in Busan was a time well spent. Below is a short video of the Hanukkah explanations and readings spoken by Josh and Kalie, our fantastic hosts. We all feasted on a traditional Hanukkah meal that included brisket, veggies, homemade applesauce, Challah (braided bread), and Latkes (potato pancakes). To Tyler's delight, we also got Krispy Kreme donuts as our Hanukkah dessert. 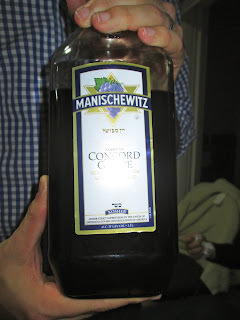 To wash it down, we had a kosher wine called Manischewitz which I thoroughly butchered by saying Man-ih-shoo-wits. Actually, it's pronounced more like Man-ih-sheh-vitz. The Man-ih-sheh-vitz was really sweet and delicious. Good people and good conversation once again made for a good time. We were happy to get some schooling on the history and the meaning of Hanukkah. I now know the significance of the highest candle on the menorah and the difference between Yiddish and Hebrew. Shalom to all of our loved ones.